We love to see you coming back, so here's a card to reward you for that! Earn your stamps on llao Reward Card with every minimum purchase of a small tub, and you'll receive your first Reward after 5 stamps! At 15 stamps, you are entitled to all 3 of our freebies worth RM43.70! 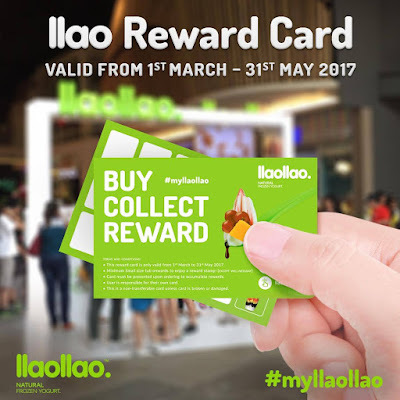 Start collecting your llaollao stamps today! This reward is only valid from 1st March to 31st May 2017. Card must be presented upon ordering to accumulate rewards. User is responsible for their own card. This is a non-transferable card unless card is broken or damaged.